Systec's Center Pivot Conveyor (CPC) can be used at any point within the overall conveyor system. The CPC is primarily used where change in load direction is required, yet the load orientation must remain the same. This is particularly applicable where pallets may be used within the system. 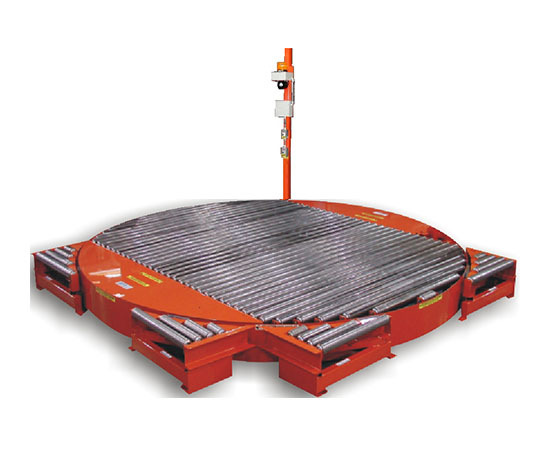 This is due to the fact pallets runners, or bottom boards, must remain perpendicular to the load carrying rollers to smoothly convey the load. Can be used as a right-angle discharge, as an in-line load rotation device (180 degree only), or as a multiple line intersection. At each feeding, or discharging conveyor line, transitions sections must be provided to bridge the gap between the square ended conveyor line and the arcs of the CPC itself. Transitions provide full load support over the width of the conveyor to assure smooth load transition on and off the CPC.